Windows Phone is the third leading mobile platform in the market today, although I must say that quite far in terms of numbers above their rivals. There seems to be a plan B that have qualified for the Microsoft operating system to work in the future with Android applications. Microsoft has an effective commitment to its users in terms of closing the gap on different platforms in the number of applications on Windows Phone, being in these times of 527,000 which are available in the Windows Phone Store, you still have 340,000 the that are available for mobile devices. No doubt that when compared to the 1.3 million applications on Google Play or iTunes, they remain quite short. One way in which Microsoft wants to narrow the gap with the other platforms is to give support to Android applications to run seamlessly on Windows 10, the next version of its mobile platform. It will be the way to create universal applications, an operating system that aims to bring together the worlds of smartphones and tablets, and even computers. This is intended to attract new developers and create a user experience much more complete. Developers can see much open market by not having to create many versions of their applications, and to focus on Android, so that later the current Windows Phone users to enjoy their work. No official confirmation, but it seems to be one of the possibilities that Microsoft is plated. Do you like to chat on BBM, Line or whatsapp? If you often chat on BBM, definitely a time you ever see the name of a friend or a BBM friends status update with funny letters? How do I make BBM status updates or display name with the cute emoticon? To change the name in the BBM or write status updates with cute and unique font, you do not have to change the font on your Android phone. All you need is an application that can automatically replace the text with funny and unique font. 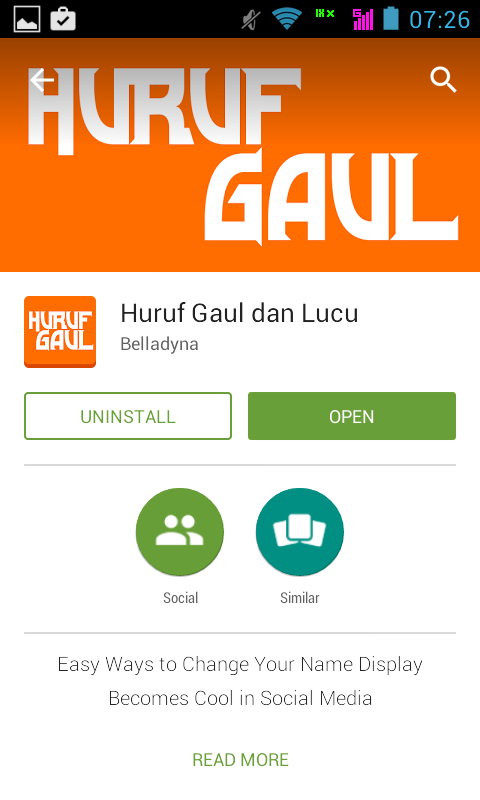 Application Huruf Gaul will be easier for us to change the text with funny emoticon, so that we can easily write the name or status update on BBM using cute font. This application can be downloaded from the Google Play Store, directly from your Android phone. Do you like to eat traditional food? Everyone would like culinary, especially when you are together with our loved ones, when we are with family or friends gathering together. Do not you love culinary claim to not play that game “Culinary Guess” game for Android. Simple game that will test you to guess the different types of food from around Indonesia and the world. Test your ability to remember the names of various foods commonly enjoyed everyday. Culinary Guess game very easy to play, and of course will test your memory about culinary. Served with a simple graph, playing Guess Culinary appear to display easily played and of course you can play this game without an internet connection, because the culinary guessing game 100% game offline.